If I had the discipline to write reviews more regularly, I'd do pick of the week reviews. This issue (#14) would most certainly take this week's honors. This is the second time I've reviewed issues from this series, so that should tell you a little something about the quality of this series. 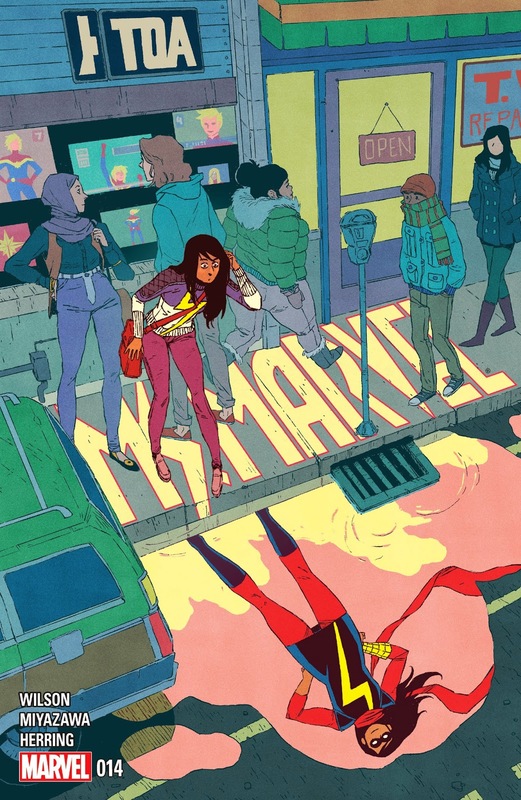 Since my last review of this series, quite a bit has changed for our hero, Kamala Khan. She's now well aware of her Inhuman heritage and is under the protection of the royal family. She's faced and bested her first supervillain, fought the likes of Loki, and even had a team-up with Wolverine. In this arc, which starts in #13, Kamala is introduced to Kamran. He's the son of an old friend of her father and a potential arranged marriage suitor. After much pleading with her father, her and Kamran go for a walk around the city. They're suddenly caught up in a destructive show of force by a new villain, Kaboom. Kamala quickly defeats her with more force than was necessary. But Kamala is still new at this and up to this point, her foes have been more than able to handle what she can dish out. After the dust settles, Kamran finds a visibly shaken Kamala and comforts her and, at the same time, reveals that he is Inhuman as well. I won't divulge any more than this to avoid spoilers where the next issue goes or spoil so much that anyone won't want to get in on reading this arc. I've already gushed on and on about how wonderful Wilson's writing is in this series and I won't do much more because this is still the same top notch stuff we saw in the first arc. I really wanted to spotlight the talent of Takeshi Miyazawa. His style is very obviously manga inspired and absolutely beautiful. His previous works include The Runaways, New Warriors, and Robotech: Invasion. He's an excellent compliment to the main series artist, Adrian Alphona's whimsical style. If Alphona leaves the book for new projects at any point, Miyazawa has my vote to continue on where he leaves off! My apologies for a shorter review than I normally do, but a good chunk of what I have to say about this series has already been said in my previous review. It's nice to see that the high quality we've seen from this series hasn't waned, even after fourteen issues. The verdict: This series continues to be of the highest quality. The art is beautiful and the writing is superb. This series is a perfect example of an all-ages book done right. It's appropriate for young readers, but doesn't pander to them; in doing so, it manages to also be quite enjoyable for older readers. I was so impressed with the first arc, I picked up the trade for a good friend's daughter. She's not really a comic book fan, but I'm sure she'll love it!